Amidst sporadic summer auto sales numbers, the Toyota Camry has seen a measurable surge in popularity. Sales of the redesigned model have risen almost 40 percent through July, according to the Associated Press. The Camry has consistently been the best selling car in America during the last ten years despite sales that were negatively affected by the devastating 2011 Japanese earthquake. A recent Automobile.com commissioned survey compared the cost to insure the Camry along with the Honda Accord and Nissan Altima - all of which are strong competitors in the midsize auto market. The survey showed Altima drivers pay an average of $917.22 for insurance each year while Camry drivers pay $956.90. The Accord was the most expensive out of the three models to insure on average at $990.89, according to survey respondents. When examining insurance coverage, Camry and Altima drivers reported choosing similar levels of protection. This suggests factors such as the value of the particular vehicle and depreciation tendencies may be some of the strongest policy cost determinants when comparing demographics. Additionally, policyholder age may play a role as the Camry appears to be attracting younger buyers. 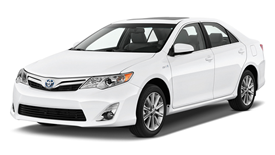 The AP reports the average age of those who bought a Camry in 2012 is approximately nine years younger than last year. The Automobile.com survey also compared driver age and found Altima policyholders were 43 years old on average while the average age of Camry policyholders was just over 48 years old. Although rates are typically lowest for middle-aged drivers, males under 25 often pay significantly higher rates than others due to accident statistics. Since Altima drivers are over five years younger than Camry drivers according to the survey, this may contribute to the cost disparity. Less surprising was the insurance cost factors that have become more prominent as the U.S. has struggled to rebound from economic woes following the 2008 recession. Over 51% of Camry drivers said the cost to insure their vehicles was the most important factor when choosing an insurance policy. Those who drive Altima and Accord models also reported the cost to insure was the most important factor when purchasing insurance at 48.3% and 50.94%, respectively. The 2012 Camry appears to be lower to the ground with less accentuated curves than previous models. The redesign has been attributed to the sales growth that has helped Toyota stay on top in American car sales. Nissan also introduced a redesigned Altima for 2013 and Cars.com recently predicted it would be capable of taking the top U.S. sales spot currently occupied by the Camry. Automobile.com users can now compare the average cost to insure almost any vehicle using the brand new model comparison feature recently launched and featured on every vehicle make section.